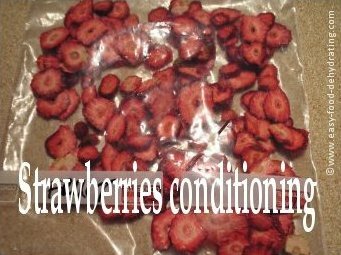 Conditioning fruits and vegetables is simply the act of letting your dehydrated goodies cool down, and then putting them into Ziploc bags and letting them hang around on your kitchen counter-top for a day or overnight. This disperses any moist air evenly between the items in the bag. When the dehydrated fruit and vegetables are done, I transfer them to a dish (or two), which I just let sit and cool down on the kitchen counter. 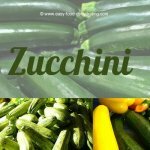 You can simply leave them on the dehydrator trays, but sometimes you forget they're still in there – hence my using bowls on the kitchen counter-top! When they are totally cooled off, I put them into the Ziploc freezer-type bags. Sandwich-style bags are not strong enough and can easily have your dehydrated foods poke through and puncture the bag! Feel free to re-use the freezer bags because they're not cheap – I do throw them away when I see any sticky residue left behind. I use some bags specifically for fruit and I use my black felt-tipped pen to mark the bags as 'fruit only', and have some bags just for vegetables. NOTE: I will NEVER re-use a plastic bag that has had MEAT in it. To be totally honest, this fourth step is a step that many seasoned-dehydrating folk just don't do. But I won't tell if you won't. If you feel like your dehydrated food is totally dry after the first go-around on the dehydrator, you can skip this step. For instance, you may like your dehydrated banana chips to be a little on the chewy side. But where dehydrating mushrooms is concerned — it is a different story. Please read on. Still A Bit Too Sticky? 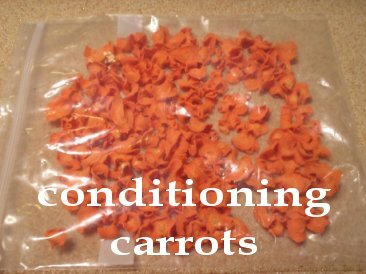 If your fruits or veggies are still sticking together a bit too much in the Ziploc bag, simply place the dehydrated food back in the dehydrator for an hour or so, and then let it cool off again. Then put the dried food back in the bag(s) again for a couple of hours. They're now ready for vacuum sealing! Mushrooms are well-known for needing a second go around on the dehydrator! You might think they are dry, but they can easily fool you. This veggie needs to be very dry prior to vacuum-sealing. When dehydrating mushrooms, take note of their special dehydrating temperatures on this page, but don't be afraid to give them more time. Some foods will remain sticky, such as dehydrated plums (prunes).